The British School Kathmandu (TBS) FOBISIA Music Teachers’ Conference 2016 Thursday 29th September - Saturday 1st October. The TBS Music team is looking forward to building on the success of the conference at The Alice Smith School by providing high quality CPD to refine and introduce new skills, and to facilitate further discussion and sharing of ideas amongst music teachers and colleagues. Whilst there is no set theme for our conference, our headline presenter is Dominic Peckham who will be at TBS all week to work with students culminating in a Saturday late afternoon performance in the historic Durbar Square in Basantapur. It is the 50th anniversary of TBS and this is one of the headline events of our celebration year. It would be wonderful if Heads of Music could stay on Saturday night to join us for what is sure to be a memorable occasion! 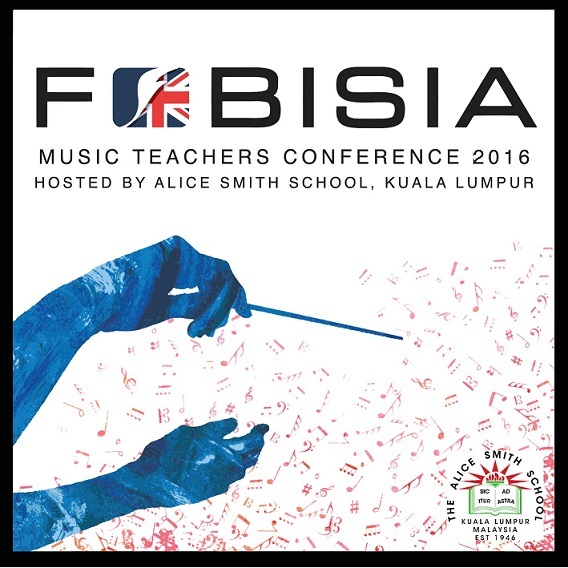 Over seventy teachers from 38 schools within the FOBISIA network gathered at The Alice Smith School, Kuala Lumpur for the annual Music Teachers’ Conference from 22nd -24th March 2016. The conference had two distinct strands this year: training for delegates and discussions within the newly formed clusters on the way forward for each of the clusters. Susanna Saw (a prolific and engaging choral conductor who works with a variety of successful ensembles) led whole-group choral sessions throughout the weekend which provided the teachers present with many techniques to engage and inspire their own choirs. 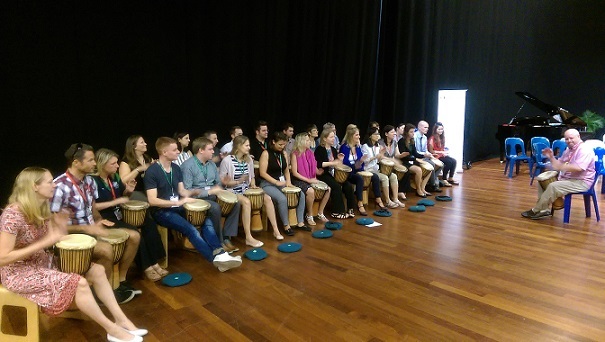 Andy Gleadhill gave delegates a taste of his skills as a facilitator of excellent percussion lessons and workshops. The delegates were also treated to performances by Alice Smith’s superb primary and secondary students. Delegates signed up for a range of workshops in learning technology, composition, percussion techniques, curriculum discussions and demonstrations from outside providers. The breadth of training available was truly impressive and all teachers left the conference with new ideas to enhance their classroom practice. A word of thanks to Liz Alwi (British School of Jakarta) for her stewardship of FOBISIA Music as co-chair for the past three years. Richie Baxter (Tanglin Trust) was elected to fill this position and drive forward the exciting changes for FOBISIA Music along with Clare Lambert (DBIS, co-chair) and the Executive Committee. Sincere thanks to Tom Nolan, Dean Evans, Ben James, Julie Anderson, and the rest of the team at Alice Smith School for hosting such a stimulating and worthwhile conference. We would also like to wish Julie Anderson of KLASS all the best as she looks forward to retiring after 22 years and a special thank you to her for her support of FOBISIA music events for all these years. The Alice Smith School, Kuala Lumpur will be hosting the next Music Teachers Conference from the 12 - 14 May 2016. Please take a look at the conference website here: FOBISIA Music Conference Website 2016 for details regarding the schedule, activities and workshops. Hotel booking by 15th April 2016. Sign up for workshops by 15th April 2016. 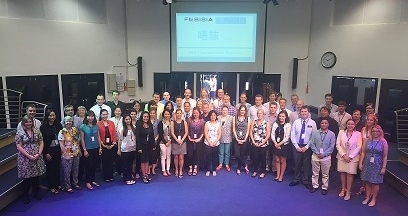 More than 50 Music teachers from schools in the FOBISIA network gathered in Hong Kong from 21st to 24th May, 2015. 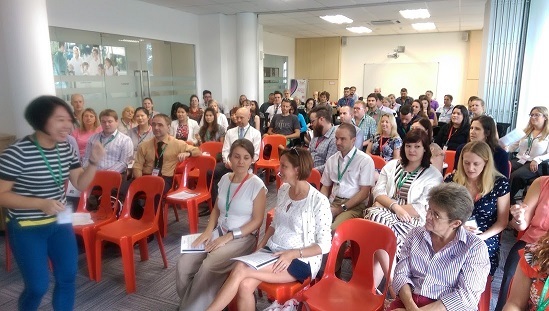 The conference was hosted by Clare Lambert and her team (Euan Kilpatrick and Cristyn Draper) at Discovery Bay International School and had two strands: Executive Committee and the general meetings where the future direction of FOBISIA Music was discussed and a variety of CPD opportunities was offered. 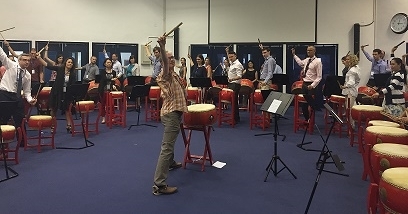 On the first day, all the teachers enjoyed the ice breaker of playing the Chinese Drums. The keynote speaker and workshop leader for the event was Amelia Chan, a violinist and the Concertmaster of the City Chamber Orchestra of Hong Kong. She gave delegates much food for thought in both the whole group and workshop sessions. A range of teaching professionals offered workshops on a wide range of topics including best classroom practice, examination discussions, composition and performance. The conference culminated in an impromptu orchestral rehearsal with Amelia supporting a number of Music teachers putting the players through their paces as conductors. Huge thanks to Clare Lambert and team for hosting such an eclectic and professionally beneficial event. 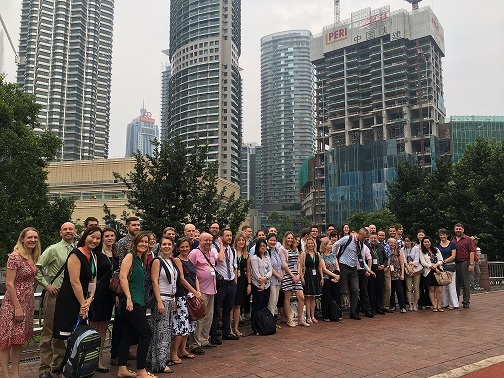 We are already looking forward to the conference at The Alice Smith School, KL next year. Discovery Bay International School, Hong Kong warmly invites you to attend this year’s FOBISIA Music Teachers’ Conference 14-16 May 2015. The conference is open to all members of your Music Department as there will be a variety of CPD opportunities on offer. The DBIS Music team are looking forward to welcoming you to our fabulous city and to hosting a conference that seeks to reaffirm and recharge your reasons for working with children and music in an International setting. The theme for our selection of workshops is rooted in the practicalities of day-to-day Music teaching in the British International School setting. At DBIS we promote a curriculum that combines creativity, collaboration, communication and critical thinking. Throughout the conference we aim to provide a variety of CPD opportunities through team building, discussion, practical activities, workshops and presentations promoting the 4 C’s. Our overall goal is for you to accumulate and hone ideas that can easily be incorporated into your own teaching setting to enhance your own music curriculum within your school.